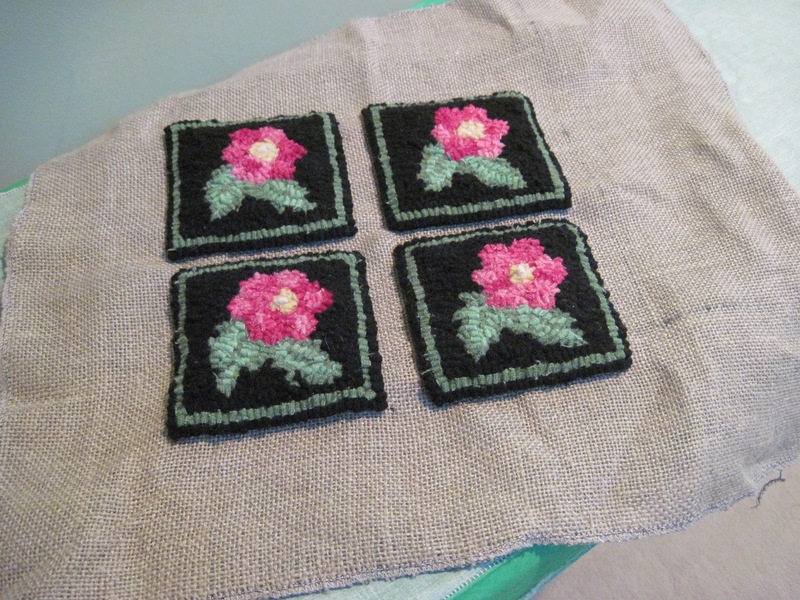 We recently got an order for my Popham Beach Roses set of four 4″ x 4″ hooked coasters. Since I had given the set we had stocked to a Popham Beach, Maine loving friend as a gift, along with the matching 8″ x 8″ trivet, I had to scramble to make a new set for our customer in California. I popped her an Etsy message letting her know that I’d have them finished and shipped by today; she ordered them Sunday evening. Luckily, I met the deadline. 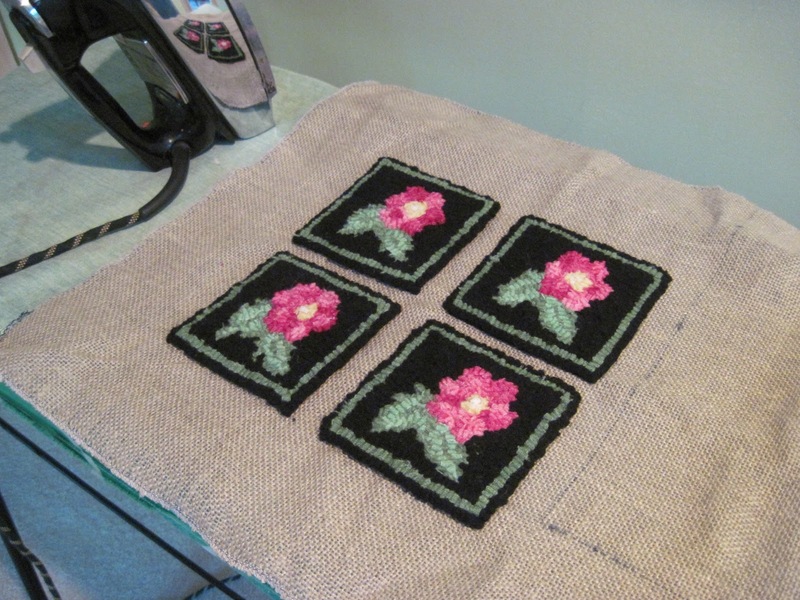 I thought along the way I’d photograph the process of finishing them and throw it out there to see if any other hookers want to offer their advice on the process too. 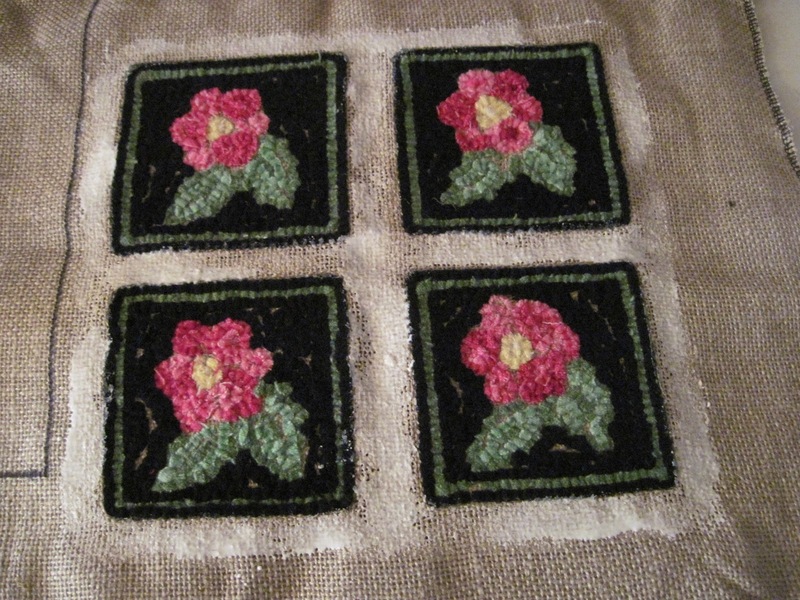 There are a lot of ways to finish items like this. 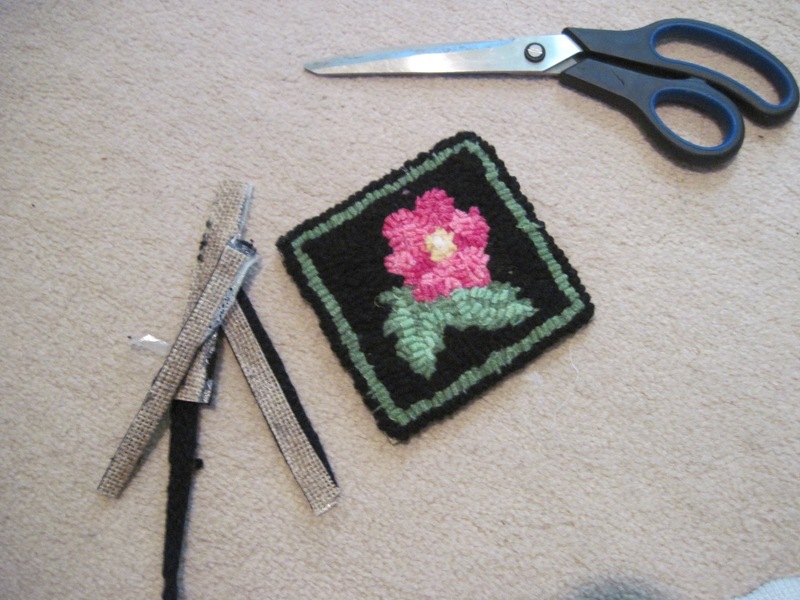 My particular method evolved through trial and error and personal preference after picking the brain of my hooking mentor, looking at her items, and reading an article on the subject in Rug Hooking Magazine. There’s nothing wildly original about my method, but if you’ve never done it before this blog might be helpful. It probably goes without saying that the next step is steaming them, but…you know the drill. Put a damp cloth over the hooked pieces and then gently blot them down on both sides with an iron. Note that my iron may be older than I am (and that’s sayin’ somethin’) – it’s a vintage find that was with my lake camp when I bought it – and it works a lot better than the lightweight pieces of junk they sell today. To me it’s always like a miracle of the universe how the wool kind of pulls itself down and in, and here and there, and integrates itself in to a much better looking piece once the steam is applied. It’s not terribly evident in photos, but it’s very obvious in person. After this I take the coasters and lay them top side up on a piece of waxed paper. I use plain Elmer’s Glue and (usually with a brush but sometimes with a finger) I run the glue all around the edges of the pieces. 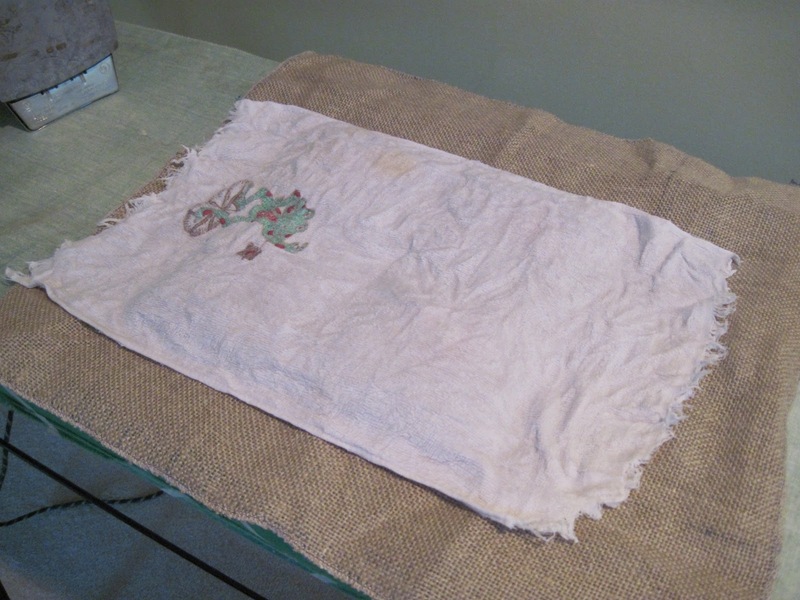 The purpose of this is to keep the linen from raveling when it is later cut. The glue is best applied to both sides. 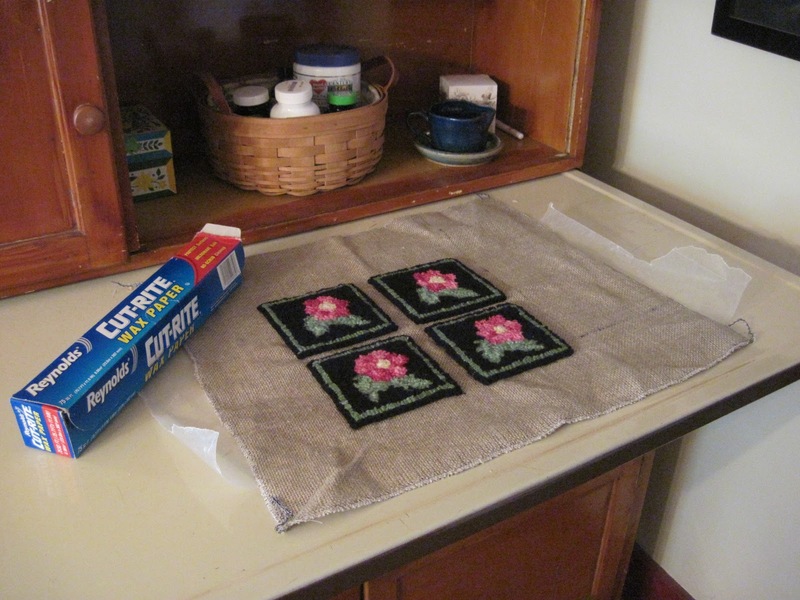 I do the top side up first so that when I turn them over there’s a little air gap for drying. I put down a new sheet of waxed paper when I flip them to make sure no glue that may have gotten on the old paper can get on the wool. At this point, you have an option. You can either go have a cup of tea, visit with friends, do the laundry, feed the chickens, whatever, while the glue dries, OR, you can use a hair dryer on warm to expedite the glue drying. I did that today because I needed to get these coasters shipped. 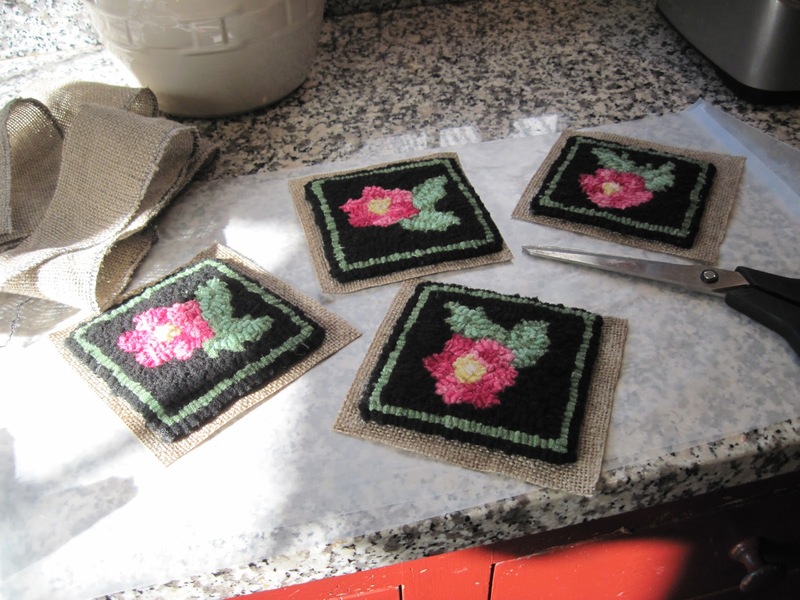 Once they are dry, cut them apart leaving maybe 1/4 to 1/2 inch around the edges. Don’t throw away your scrap linen! 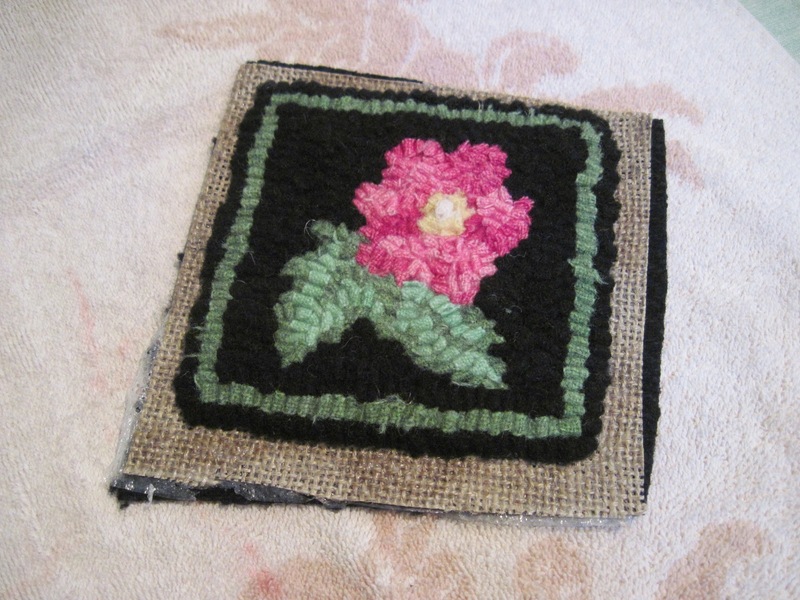 I have been admonished to keep it by a) my mentor Connie who uses it sometimes to extend a piece for better fit on a frame and b) by Lou, owner at the Secret Garden gift shop in Oxford, Maine who said she has crafters who use it to make little primitive art pieces. So…waste not, want not I guess! Next, cut a piece of a double sided heat activated plastic about the size of your coaster plus edge. I use something called “Heat Bond,” but I know other hookers and crafters use other products that they have a preference for. 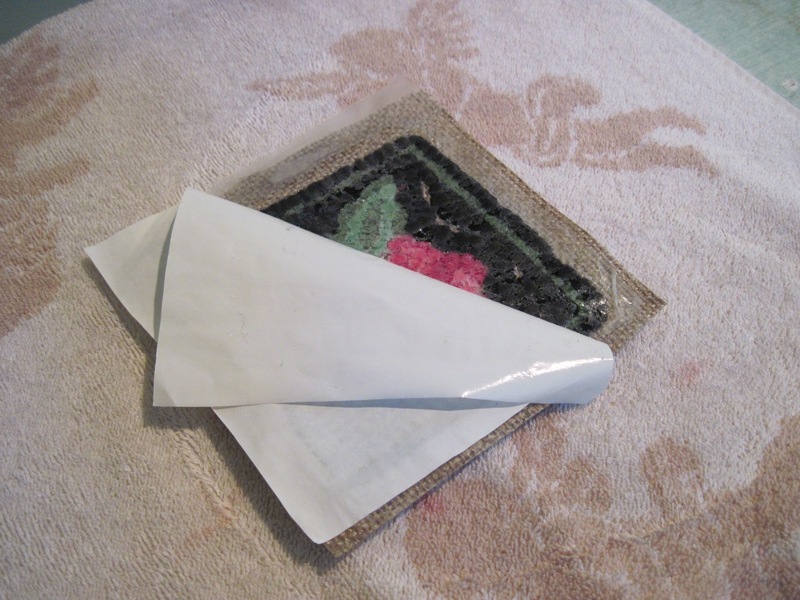 This material is inexpensive and easy to find, and just as importantly, easy to work with. 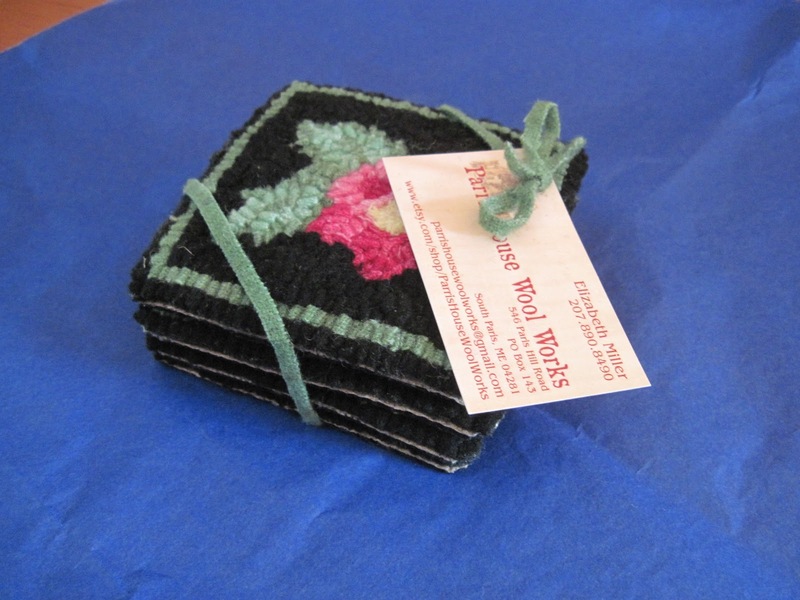 I’ve tested my coasters and trivets and this material also keeps any moisture off the surface you are using the item on. Then, place the Heat Bond plastic side down on to the back side of the coaster, apply heat with a medium iron, and let cool for a moment. Peel back the paper and you’ll see that the back side of your coaster is now plastic coated. 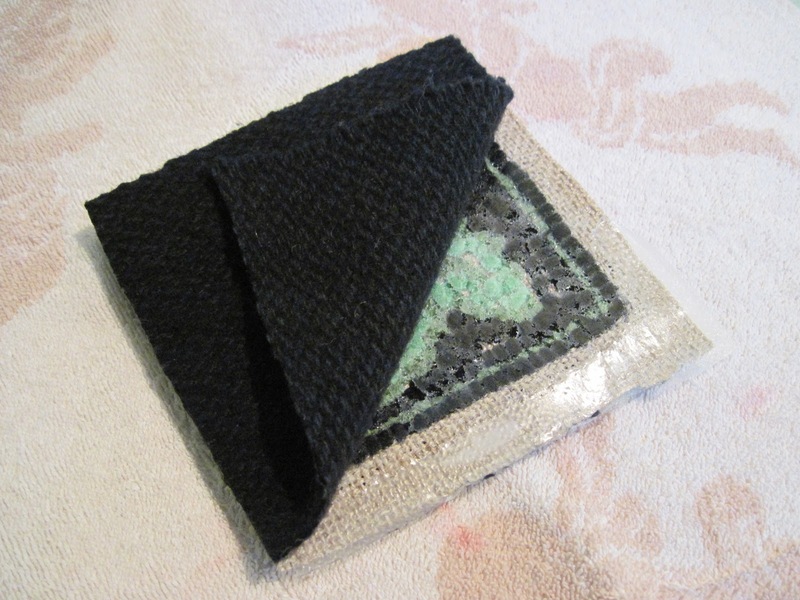 Next….take the wool you’d like to use as your backing (I used a pretty black herringbone I dyed last spring) and place it over the plastic side. Again, apply heat from the iron. 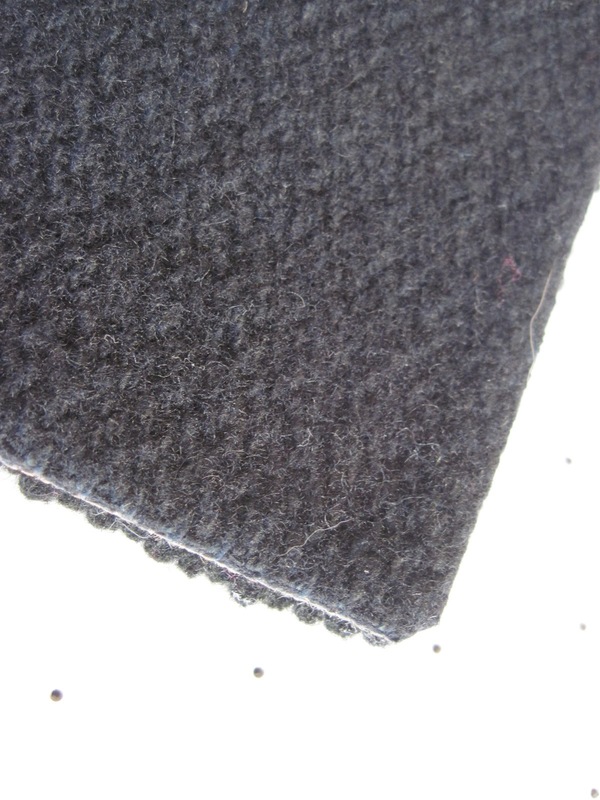 I find that using a damp cloth between the backing and the iron creates a steam effect that helps transfer the heat through the wool backing and creates a nice tight bond. This next step is, I think, the scariest part but you get used to it. Trim away the excess around the edges very carefully, getting as close to the edge as you can without nipping any of your loops. My mentor/teacher, Connie Fletcher, uses pinking shears and leaves a cute little pinked edge. I have also seen that method written up in magazines. For these pieces I opt for a straight edge invisible from the top, but you could do anything you liked. This is what they look like from the side. I do not mind, and the people who have purchased or received these as gifts don’t mind, that the linen is visible from the sides – in fact, I like the primitive look of that. 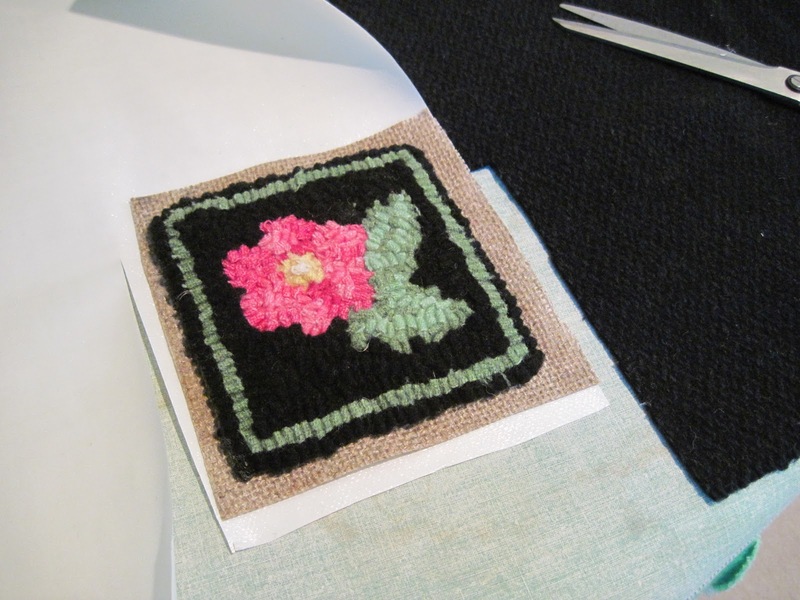 IF you do mind it though, I’m sure an overstitch binding could be applied, or some other solution. For these pieces, I’ve kept it simple and I do think they’re still pretty. Hooked in the Mountains XVI – Wow! Just what I was looking for! Thanks so much! Haven’t even hooked my first coaster, but am ready to give it a go! Thanks for posting, I always bind and curse under my breath. This would be a better option. I don’t understand one thing. It says you glue both sides. Both sides of your coaster? Front and back? Over top of your loops? Hope that doesn’t sound stupid but I’m. Ot following that step. Thanks again. No, you never want glue on your loops, and there is no glue on the back of the loops either. The glue is only used to secure the raw linen around the hooking, so you’re just spreading glue around those edges – like a window frame – on both sides. The backing to the coaster is held on by the Heat Bond material after the glue is dry. I think if you review the step by step again, you’ll get it, but let me know if it’s still unclear. Hi Beth, Like your demonstration – now to find the products you listed (I live in Nova Scotia Canada and about 60 miles from a large Craft store like Micheals – though here we are used to traveling for things we need. ). 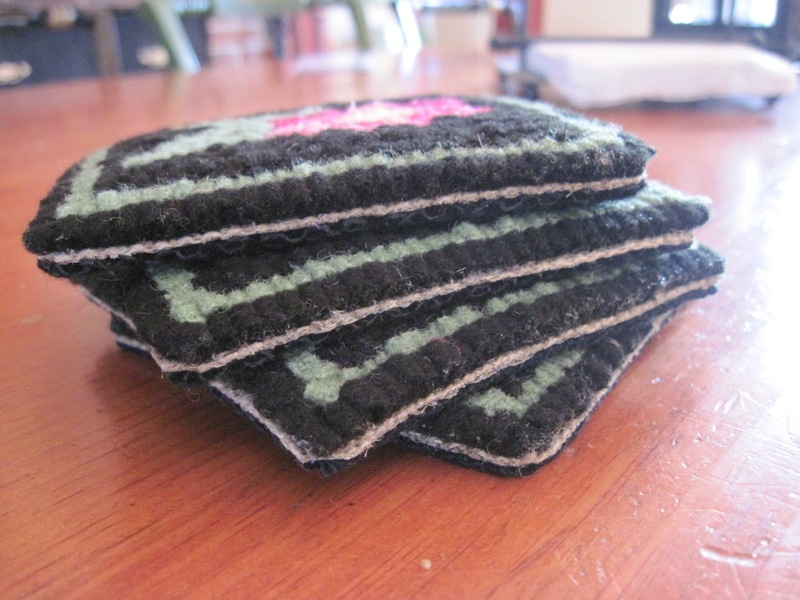 I usually bind my rugs (I haven’t made that many!) 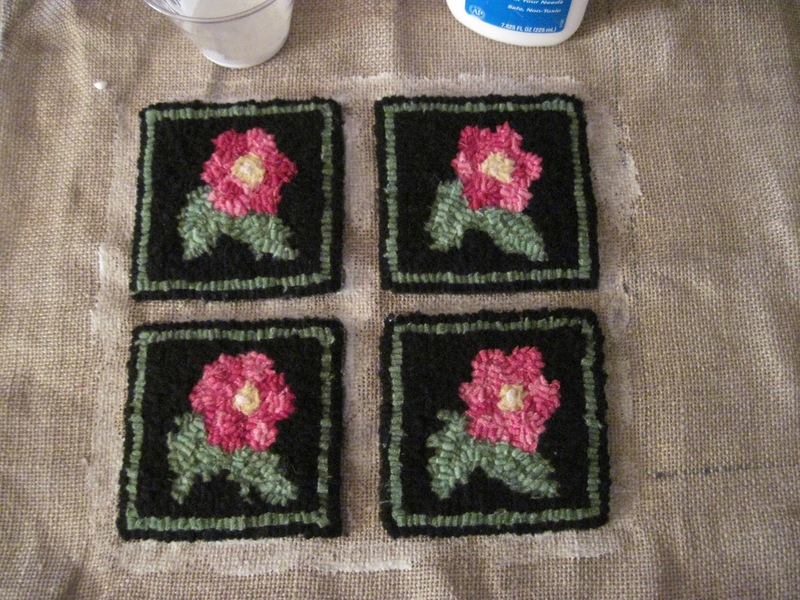 And I might use yarn around the edge after I finish the coaster but I love what you did. I find you r instructions easy to follow thank YOU.